This Benjamin Franklin letter is part of a series of letters Franklin wrote revealing his observations and experiments about electricity. The first five letters were published by his British friend and member of the Royal Society, Peter Collinson, in a book called "Experiments and Observations on Electricity Made at Philadelphia in America." That book was the most reproduced book of the eighteenth century and made Franklin a household name. Later editions of the book contained more letters, both from and to Franklin, regarding his electrical studies. In this letter to Cadwallader Colden, Franklin talks about the silliness of thinking lightning strikes are acts of God and his discovery that lightning strikes often go up from the ground rather than down from the clouds. 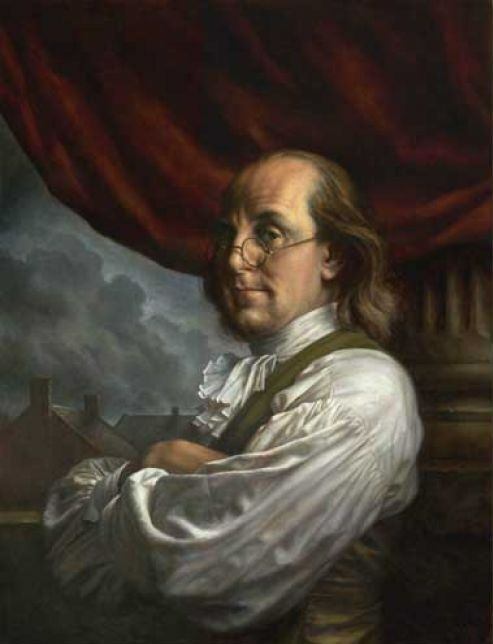 You can find links to the other letters here - Benjamin Franklin and Electricity letters. I received your Favour of March 20. and a subsequent one without Date, containing the Description of Lord Macclesfield's Mural Quadrant. No Vessel has sail'd hence for England these three Months, but one goes next Week by which I shall send your Answer to the German Professor, corrected as you direct. I see it is not without Reluctance that the Europeans will allow that they can possibly receive any Instruction from us Americans. Kanster opposes your Principles, and Nollet mine. He has lately wrote and published 6 Long Letters, directed to me, on the Subjects of my Pamphlet, in which he imagines he has taken me all to pieces. I have read and consider'd them, and remain of the same Sentiments. In one or two Places, he seems to apply to the superstitious Prejudices of the Populace, which I think unworthy of a Philosopher: He speaks as if he thought it Presumption in Man, to propose guarding himself against the Thunders of Heaven! Surely the Thunder of Heaven is no more supernatural than the Rain, Hail or Sunshine of Heaven, against the Inconveniencies of which we guard by Roofs and Shades without Scruple. But I can now ease the Gentleman of this Apprehension; for by some late Experiments I find, that it is not Lightning from the Clouds that strikes the Earth, but Lightning from the Earth that Strikes the Clouds. They are electrified negatively and the Earth positively. This will seem a surprizing Position to you and to all Mankind; It will, when demonstrated, make a great Alteration in our Theory: But as to the Methods propos'd for Practice, to guard against the Mischiefs of Lightning, they remain the same. You are the first I communicate this to, not only as a Mark of my Respect, but that you may consider if it has any Relation to your Principles. I only request that you would not divulge it at present. It is expected that I should answer Mons. Nollet. You see, this must at present engage the little Leisure my other Affairs afford me, and oblige me to defer explaining my self at large on the Objections I have to your Book. I must own too, that I am under some Apprehensions of sinking in your Esteem by it, unless I could well support those Objections; and I am diffident of my self, knowing my Deficiency in Mathematical Knowledge and in such Reasoning as must in some Degree depend upon it. I will confide however in your Candor, and tell you, that I cannot, after long considering the Point, persuade my self that there is in Matter any such Principle as is imagined under the Term Vis Inertia. I even conceit that the contrary may be demonstrated, i.e. that Matter gives no Resistance to Motion. But in this, all the World is against me, and with you; so that I have reason to be diffident, and slow. If I do not admit the Principle, I must think all you have said to explain it, wrong. After this Acknowledgement, I think you will be in no pain about my Objections, if you were before. But if you will send me another Copy of your Book, (for I cannot spare this) I will communicate it to a Person of Worth and Candour, and of a very philosophic Genius, to whom these abstract Researches are more familiar and more engaging than to me; and who will be, I think, such a Correspondent as you desire. He lives near Boston, and therefore to save Postage to you both, let me be the Medium of your literary Commerce. I may then with your Permission have an Opportunity of seeing what passes between you, and perhaps assisting now and then with occasional Remarks. I think it behoves us all to join Hands for the Honour of the American Philosophy. The Gentleman is Mr. James Bowdoin, who with a great Fortune has a most amiable Character. I thank you for the Transcript of Lord Macclesfield's Letter, and for the Hints concerning our Observation of the Transit. I wish we may have fair Weather, for I think nothing else will now be wanting. I send you some Ears of Barley from Barbary, which our common Friend Mr. Collinson sent me. It is said to be of an extraordinary Kind for Goodness; perhaps it may suit our Climate if the Seed can be sav'd, to which End Mr. Collinson advises sowing it in a Garden at first, where Care may be taken of [it]. I sent you last Post, a Catalogue of [torn] about your Place with a Letter from Linneus [which] I hope got safe to hand. The late Magazines ([both?]. London and Gentleman's) for several Months, have Extracts from, or Summaries of particular Parts of your Book, and promise a Continuance; by which I see it will make a great Noise. You will scarce allow me to congratulate you on these Occasions, reserving to yourself an exclusive Privilege of complimenting your Friends, in which I think you are a little arbitrary.